Everyone is capable of doing a decent job of painting a room. However, the skill of a professional painter can take your painting project to the next level. While pros certainly have more experience than the average homeowner, they also know several tricks and techniques that, when followed by a homeowner, can help out tremendously. Here are some of their secrets. To begin your painting project, clear everything from the room. While you might spend a half hour doing this, you’ll get all that time back and more by being able to maneuver around the room more easily. While your walls and ceiling might appear to be in great condition at first glance, shine a lamp or flashlight over all areas to find and fix imperfections. You can use a lightweight spackle for minor dents or a heavier duty spackle for deeper dents and cracks. Most pros prefer to cut in ceilings and trim with a brush vs. taping off all areas. If you can cut in, the process will be much faster than applying tape, painting and removing tape. However, if you aren’t skilled at cutting in, you’ll get a much better result using tape. Be aware that taping has it’s own set of problems. Paint can bleed under tape and latex paint tends to ‘bridge’ or for a skin on top of the tape that can tear when you remove the tape leaving a jagged edge. To prevent these issues, press the tape firmly with a putty knife upon application and score the tape with a razor blade upon removal. A good paint job starts with a good primer. Save yourself time by having your local paint store tint your primer close to the color of the topcoat. After you repair and sand the walls, you can apply a solid coat of primer and finish up with a solid coat of quality paint. Another added benefit of this technique is that primer is generally cheaper than paint so not only will the finished product be of better quality, but you’ll also save yourself some money in the process. Touch-ups are unavoidable. So be prepared to handle them by saving at least ¼ to ½ gallon of paint. For small spots requiring less than 1 square foot of touch up, you can use a brush and apply the paint by dabbing it on to mimic the texture of a roller. For larger areas, you’ll most likely need to re-roll the entire section of wall to avoid seeing the outline of the newly painted area. The thicker the nap of a roller, the more paint it can hold, but the more texture it will add to the wall’s finish. A good choice for a roller’s nap is 3/8”. Most pros don’t reuse their roller covers and just toss them after each job. Avoid fatigue and neck strain especially when painting ceilings by using a telescoping paint pole. This will help provide leverage to add pressure to your roller to ensure you get proper coverage on walls and ceilings. Poles can help shorten the required range of motion and can help you get through that large painting project. A quality brush can make all the difference when painting a room. Cheap brushes loose their bristles or fray, making it near impossible to cut in a crisp line. Most painters prefer to use an angled sash brush to cut in walls and trim. A quality paintbrush will cost between $15 and $30 but is well worth the investment. They’re typically available in widths from 1” to 4”. For most universal application, a 2 ½ “ brush is best. To save time and energy, roll as close as you can to ceilings and trim before cutting in. This way, the amount of area you’ll need to cover with your brush is minimal. If your painting project requires multiple days to complete, don’t waste time cleaning your brushes and rollers each day. Wrap them up in plastic wrap or bags and stick them in the fridge to prevent the paint from hardening. Just make sure they are returned to room temperature before you begin using them again. If you’re determined to tackle a painting project yourself, these tips can help you get the job done right. However, if you are still hesitant, it’s best to let a pro handle the job. Homespree makes it easy to request painting estimates. 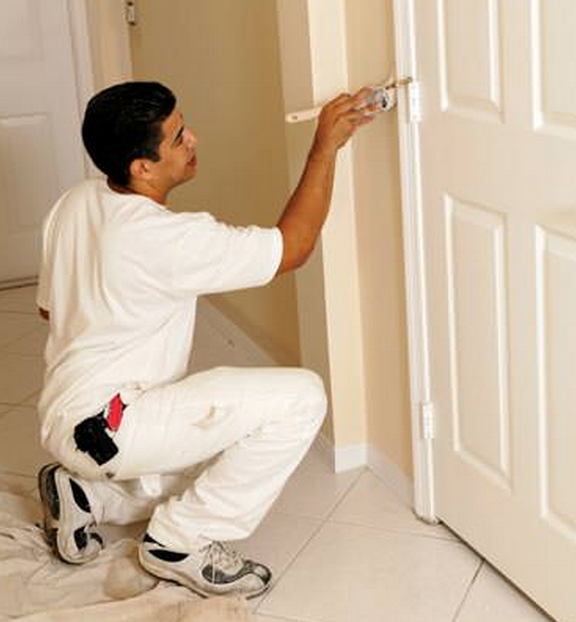 Find a quality painter and price out your job here now! This entry was posted in Installation Guide and tagged Painting, Pro, Secrets, Tips, Tricks. Bookmark the permalink. ← How Do You Find a Good Painter?